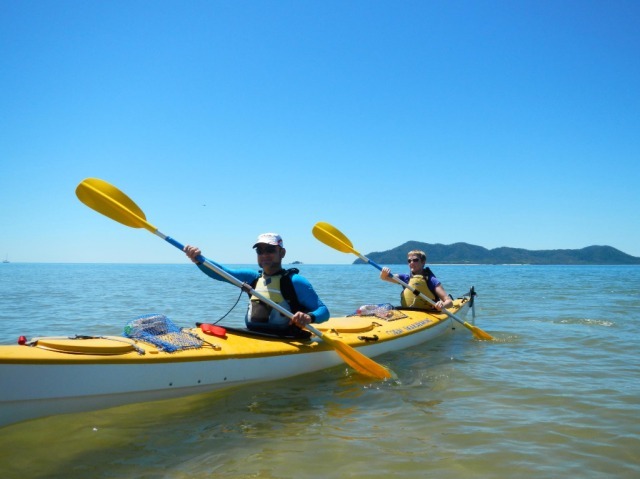 Coral Sea Kayaking offer half day, full day and overnight sea kayaking tours departing from Mission Beach, visiting many of the National Park islands in the region, such as Dunk Island, Hinchinbrook Island and the Family Island group. 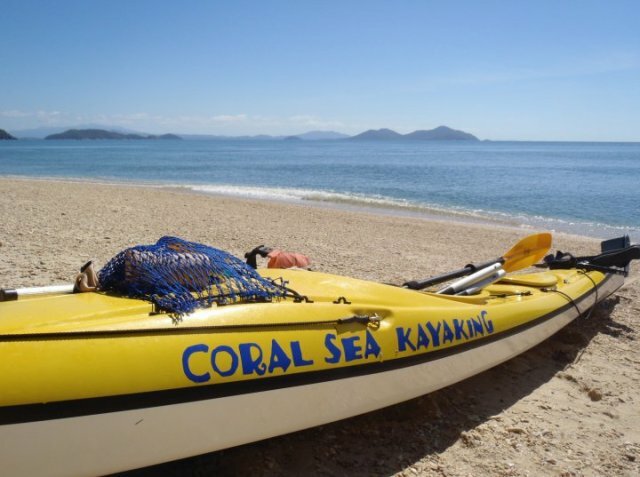 Coral Sea Kayaking is a great low impact way to experience the magnificent islands and reef surrounding the Mission Beach region. 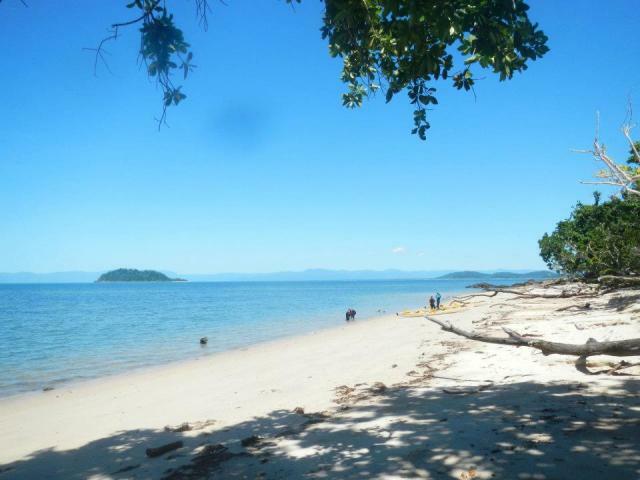 Come and enjoy Dunk Island as nature intended. 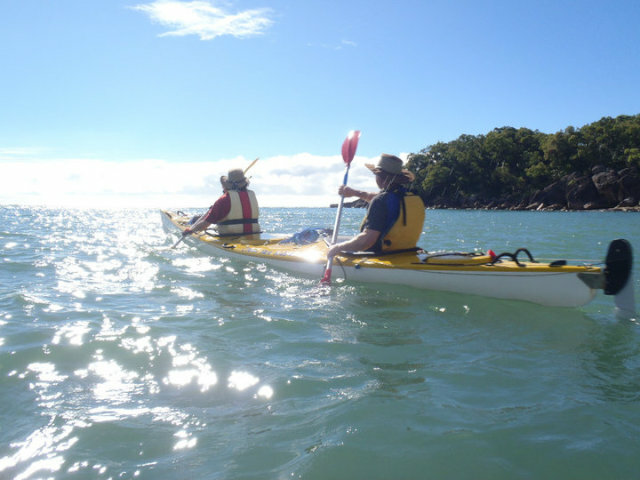 Sea kayaking is an active, fun and eco-friendly way to explore the area. Away from the noise and bustle of motors, simply glide along the surface of the water and enjoy the views of the colourful corals and watch the turtles and rays swim past. 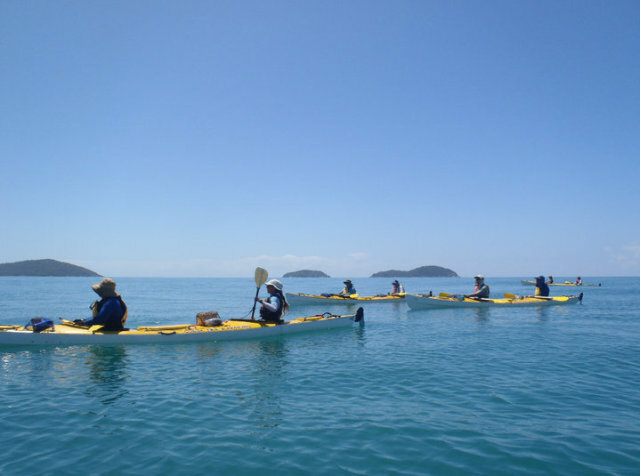 We leave South Mission Beach and paddle across to Dunk Island, this is an easy paddle and no experience is necessary. Whilst crossing we may be able to see dolphins and turtles. Stopping at a near by island for a midmorning snack before exploring the shallow waters of beautiful Dunk Island. 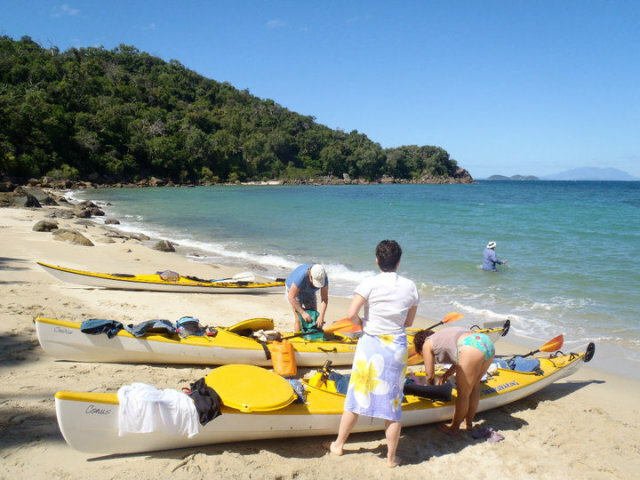 On Dunk Island we can enjoy a walk through the rainforest and learn about the island ecology and history, then continue on to a secluded bay to swim in the warm clear tropical waters. Lunch will be a selection of delicious salads, cold cuts and tropical fruit. After lunch we have time to relax on the beach or try snorkelling to get a closer look at the coral and tropical fish of the fringing reef. 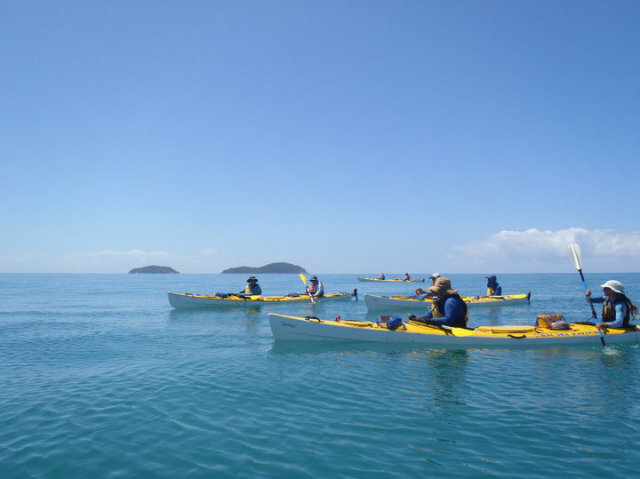 Then we can return to our kayaks for the afternoon paddle to further explore the nearby islands before we head back to the mainland. 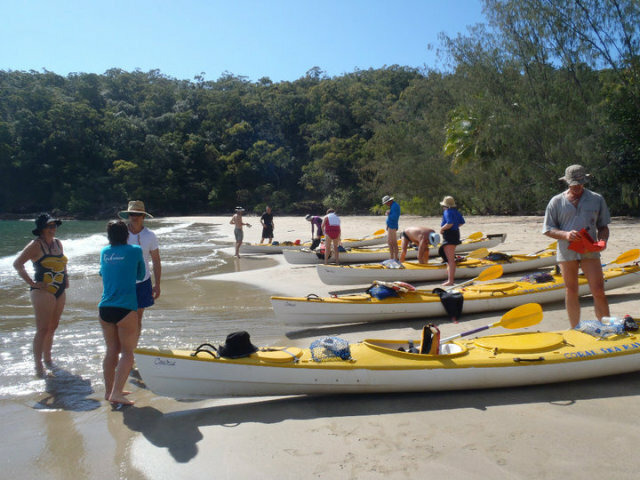 We paddle from South Mission Beach along the coast, passing golden sandy beaches and rocky headlands offering us a chance to see green turtles who feed on the shallow seagrass beds, if we are very lucky we might even glimpse a dugong. Many birds inhabit this scenic coastline and we will spot reef egrets along the rocky headlands and perhaps an osprey or sea eagle soaring overhead. 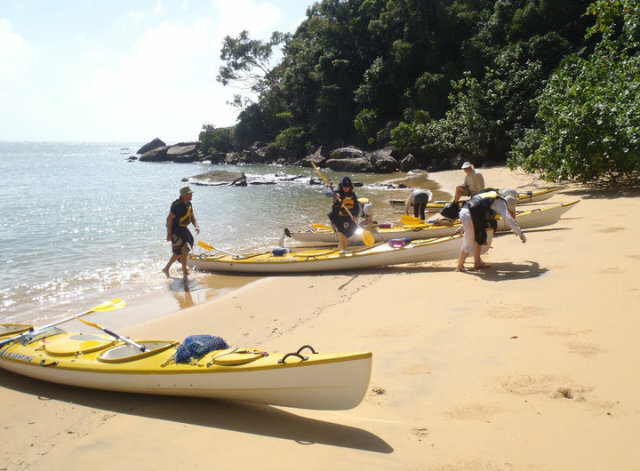 We will stop for a break along the way to enjoy some homemade snacks and fresh tropical fruit allowing time to explore the rainforest-fringed beach. 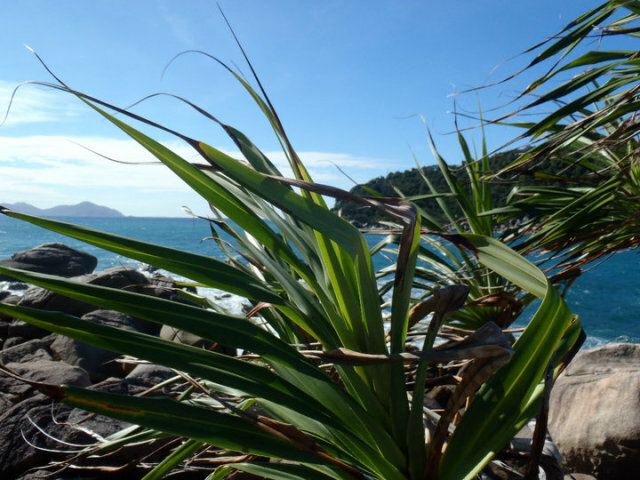 Our friendly experienced guide will give all the instruction necessary and provide plenty of information regarding not only the fascinating flora and fauna but also the interesting local pioneer and aboriginal history. You don't have to be really fit to join our day trip, anyone who enjoys a bit of exercise can do it. How long does it take to reach Dunk? It takes about an hour and fifteen minutes to paddle across to the little islands off Dunk. 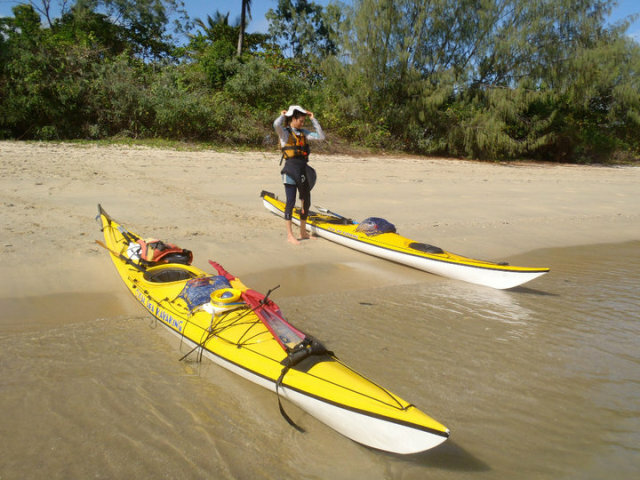 Here we take a break and have some homemade muesli bars, stretch our legs and check out the mangroves growing near the island. 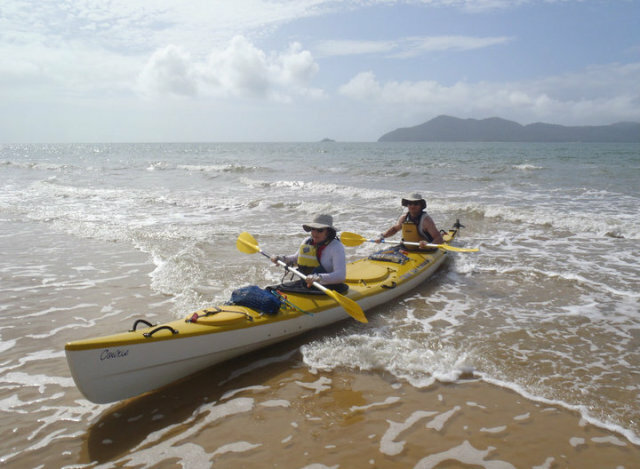 Then we paddle slowly across the fringing reef, which is only a short distance to the beach. 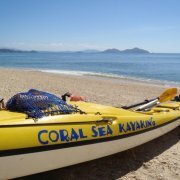 Yes, we do provide snorkelling gear and you can snorkel off the beaches, over the fringing reef you will see some corals and small colourful fish. If you haven't snorkelled before our guide will be more than happy to help you get started. What marine life will we see? 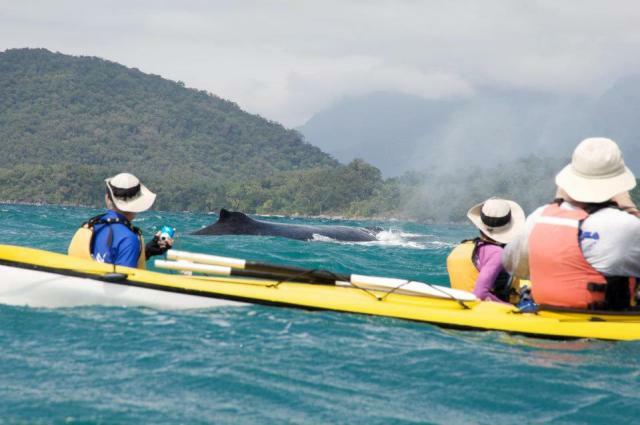 Whilst paddling across we may be lucky and see dolphin. As we get closer to the islands we often see turtles resting on the surface. As we cross the fringing reef we often see rays and other fish. Dugongs do frequent the local waters but they are very shy, and are only seen occasionally. 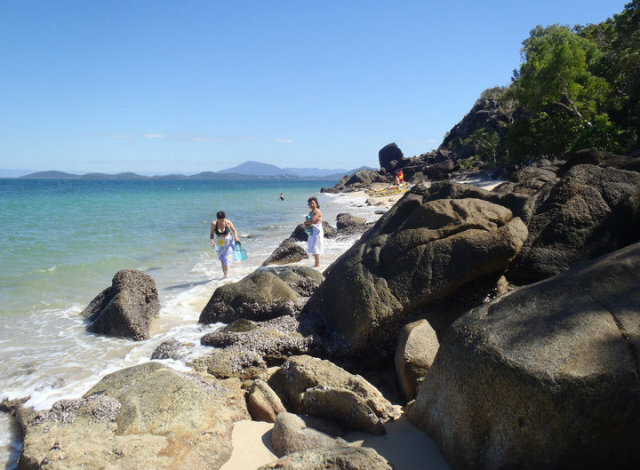 We often see many sea birds, many terns breed on these islands and osprey and sea eagles inhabit Dunk island as well. 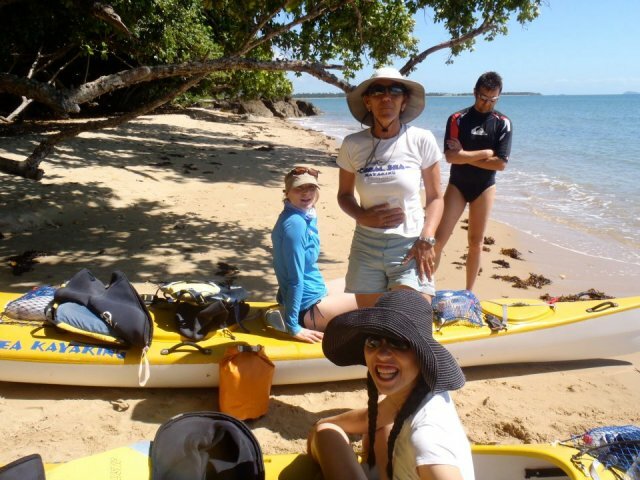 Coral Sea Kayaking is a small company and either David or Attie will guide your trip, they have both lived in Mission Beach for many years and have a great love and knowledge of these islands and waters. 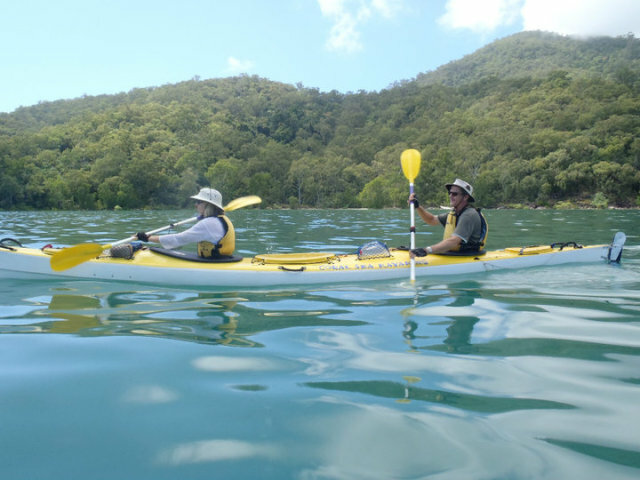 They are both experienced adventure guides and qualified Sea Kayak Instructors, they are good fun and enjoy sharing the wealth of information they have about the region. What do we get for lunch? Everything is supplied for your whole day. We will have a picnic on the beach, which includes yummy fresh salads, cold cuts, and loads of fresh fruit most of which is grown in our own garden. There is plenty for lunch to satisfy even the hungriest paddler. Do we go into the forest? 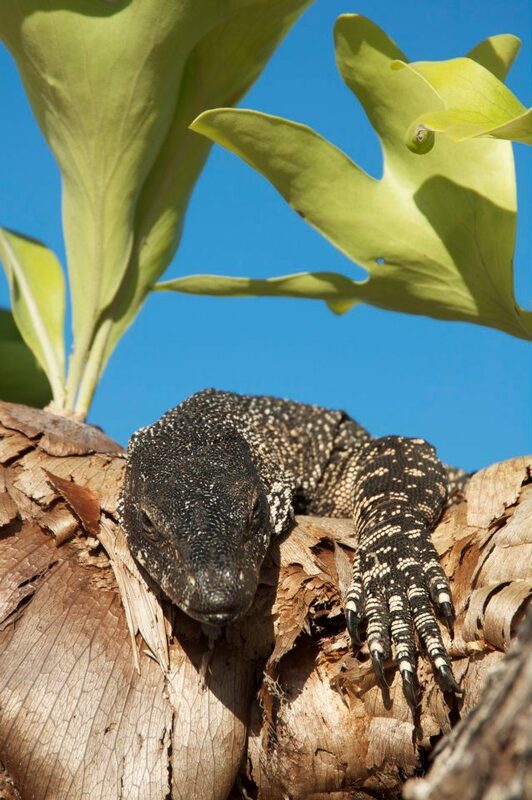 Yes, your guide will tell you about the type of forest on the islands, the trees and seeds that can be found. What plants were used by the aboriginals and also about the fauna. You will also learn which birds live or visit the region and much more about the cultural and natural history of the islands. 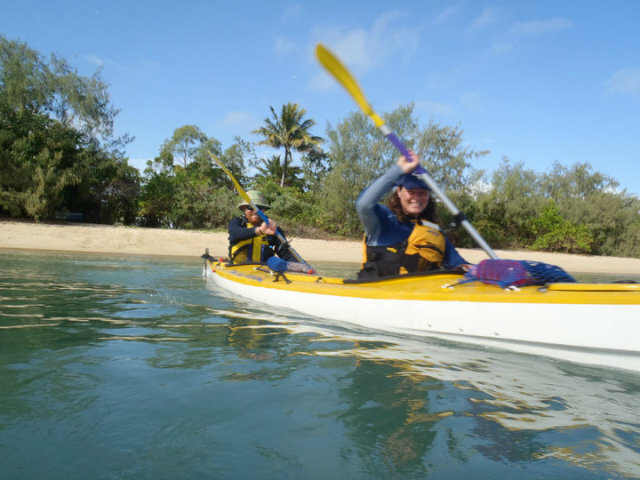 No, you don't need to have any experience of paddling or sea kayaking and our guides are fully qualified to instruct you in all the basic paddling strokes and are there to help teach you all the skills you need. 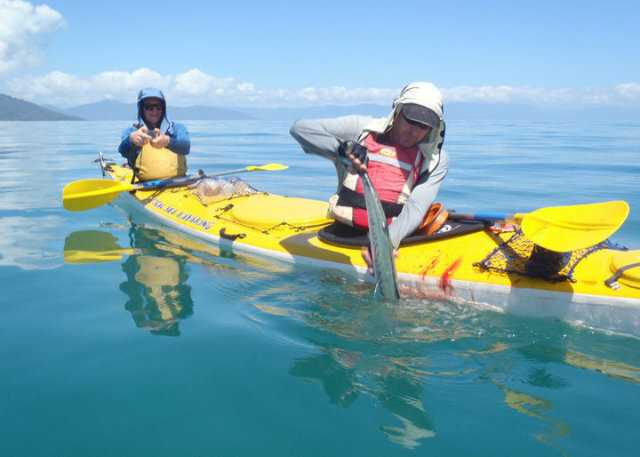 Sea kayaking is pretty simple though. In the event of very strong winds, the trip will not go. However if the conditions are good we will depart. Sometimes the wind may build up during the day, but as we have access to many different beaches, we can always find a beach on the lee side of the island. 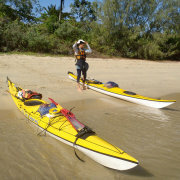 When paddling home we will have the wind behind us so it will be helping us along. 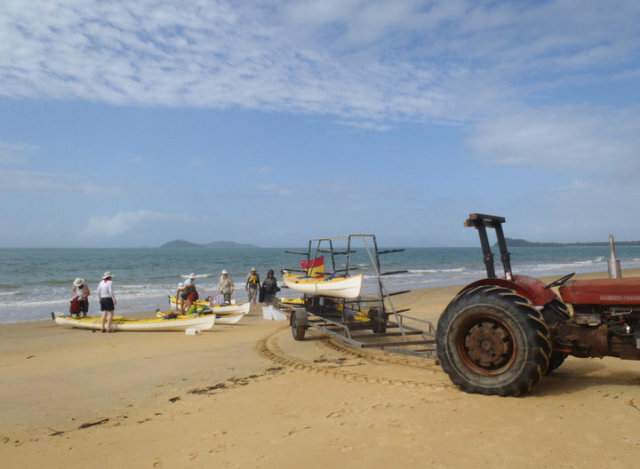 If the weather deteriorates during the day and the guide feels it would be unsafe to paddle back it is possible to return to Mission Beach via the water taxi; although, this is a very rare occurrence. The guides always carry a mobile phone and have first aid qualifications in the event of an emergency. A first aid kit is carried on all trips.